I have wanted to provide an update on Oscar for a long time but have struggled to find the right words to say. 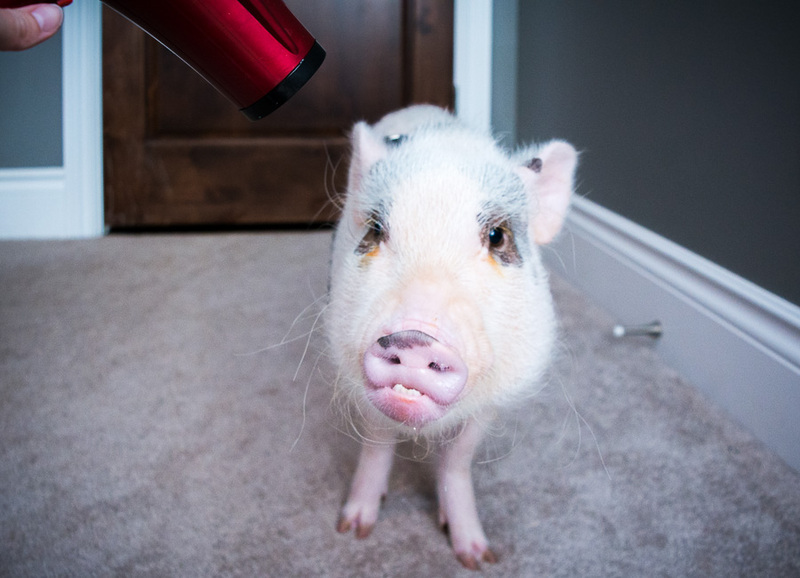 I started this blog right after we brought Oscar home because I was having trouble finding information about day-to-day life with a mini pig. Although I had done my research on mini pigs, I had no idea what to expect when we brought him home. 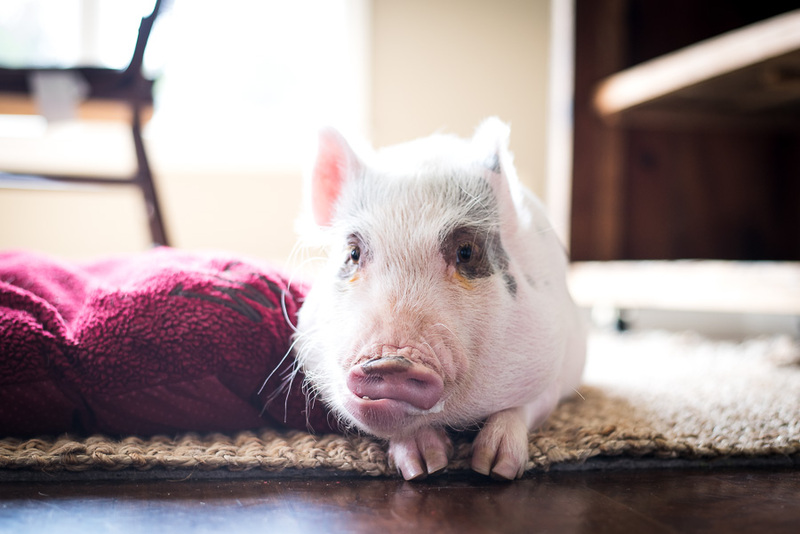 I loved writing this blog and sharing about Oscar because he meant the world to me and also because it helped connect me to other “pig people”, many who were amazing resources to me as a new pig parent. 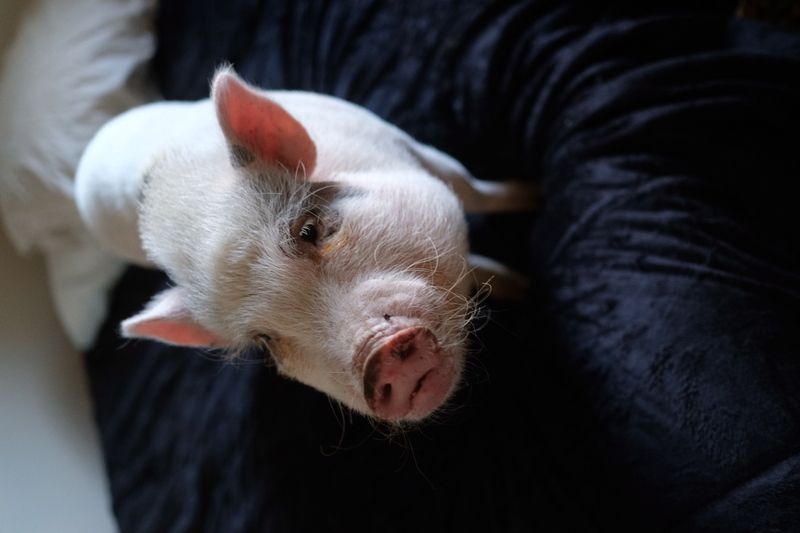 Although I knew I wanted a mini pig and was excited about bringing Oscar home, what I didn’t expect was how hard it would be at times and, at the same, how much I could love a pig. Oscar became my world. He is funny, charming, incredibly aware, sweet, cuddly, and so much more than I ever expected. I hope that my love for Oscar came through in his blog, and I also hope that it still shows as I write this update. One of my goals with the blog was to be completely honest about life with Oscar. I didn’t want it to be a “highlight reel” of only the best moments. I wanted to be open about the tough days too. My reasoning was that, while pigs are amazing animals, I wanted people to know what they were getting into when deciding whether or not to bring a mini pig home. It doesn’t help potential owners or pigs if I only share the good and leave out important information about the struggles and harder days of owning Oscar. In remaining true to the reason I started this blog, I want to update on why I stopped writing and where Oscar is now. It has taken me so long because I needed some time to decide where I stood on mini pig ownership and the message I wanted to send. One of the biggest struggles we had while owning Oscar was his relationship with our dog, Rylee. Although they started out having a decent relationship, that changed over time and as Oscar outgrew Rylee. I wrote several posts on their relationship and our challenges with it, which you can read in this previous post. Their relationship grew more and more tense, with Oscar challenging Rylee any time they crossed paths in the house. Since Oscar was eventually so much bigger than Rylee, it became a real issue we had to deal with. Oscar would charge at and corner her while trying to bite, and Rylee was small and old enough that she would occasionally fight back but couldn’t sufficiently stand her ground. Eventually, she started spending almost all day under our bed because it was the only place where Oscar couldn’t get to her. When she did come out, she would sneak around the house trying to avoid him. Ultimately, we decided the risk to her safety was too high and her quality of life was quickly decreasing, and we had to make a decision. This was a horrible decision and took several months for me to finally make. I loved Oscar to death, but Rylee was already 11 years old and I had made a commitment to her that I felt I needed to keep. We looked for a long time for the right place for Oscar which was an excruciating process. I only wanted him to go somewhere he would be happy. 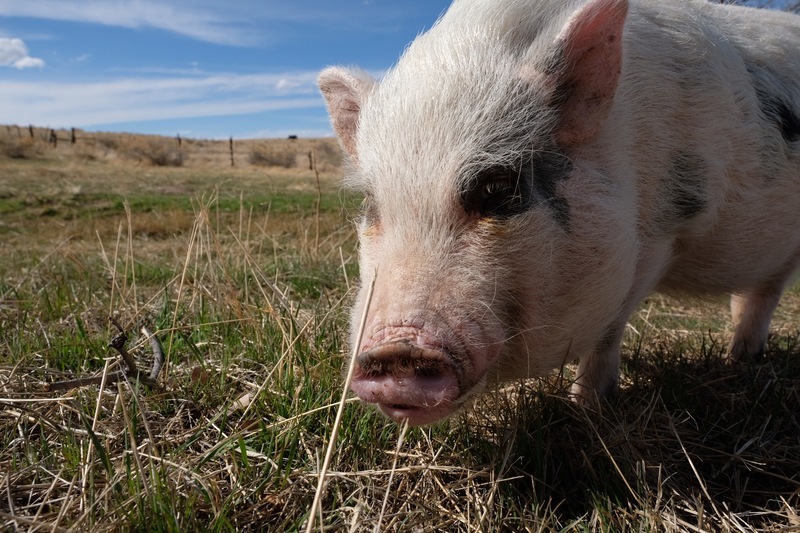 After talking with several families and nothing being the right fit, I contacted Hog Haven Farm in Colorado to see if they would be the right place for him and to see if they had space. Erin at Hog Haven was so helpful and answered all of my questions, and we decided that was the right place for him. Oscar taking over the guest bed at Hog Haven Farm. The day we packed Oscar up to take him to Hog Haven was one of the worst days of my life. I absolutely did not want to give him up. I loved him so much, and he just made my days brighter. Cuddling with Oscar was hands down the best part of every day. I had full intentions of keeping him forever, so I was devastated and heartbroken and extremely embarrassed to be taking him to a new home. I knew he would be loved at Hog Haven Farm, but I wasn’t sure if he would adjust well or if he would get along with other pigs or if he would even be okay without us. We arrived at Hog Haven to a warm welcome from Erin. She was helpful and compassionate as I stood there bawling and trying to figure out how I was going to be able to say goodbye and walk away from Oscar. Oscar wandered around a bit with one of the other pigs, Morty, and seemed to be doing okay for being in such a new situation. We got in the car to come home, and I felt so empty. I felt like I was doing what I had to do for Rylee, but that pig had come into my life and had changed it. Yes, we had hard days and struggled, but I also had no idea how much I would come to love and adore him. That was back in January, so how is Oscar now? He is doing amazingly well. Actually, within a day of us dropping him off at Hog Haven, he found a “girlfriend.” Her name is Annabelle, and she was also new to Hog Haven. They quickly bonded, and Erin and her husband, Andrew, have actually decided to keep both Oscar and Annabelle as their own instead of adopting them out. As Oscar does, he wiggled his way into Erin’s heart as well. 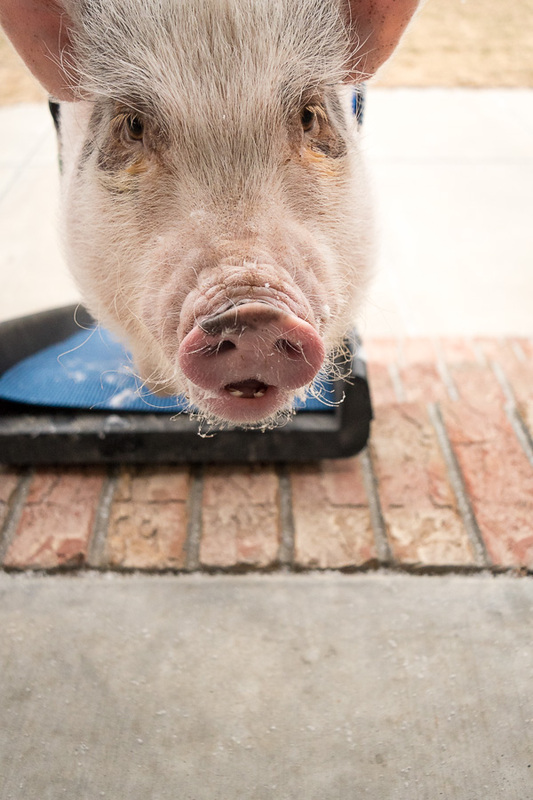 He is a therapy pig and goes to nursing homes with Erin and performs his tricks for everyone. 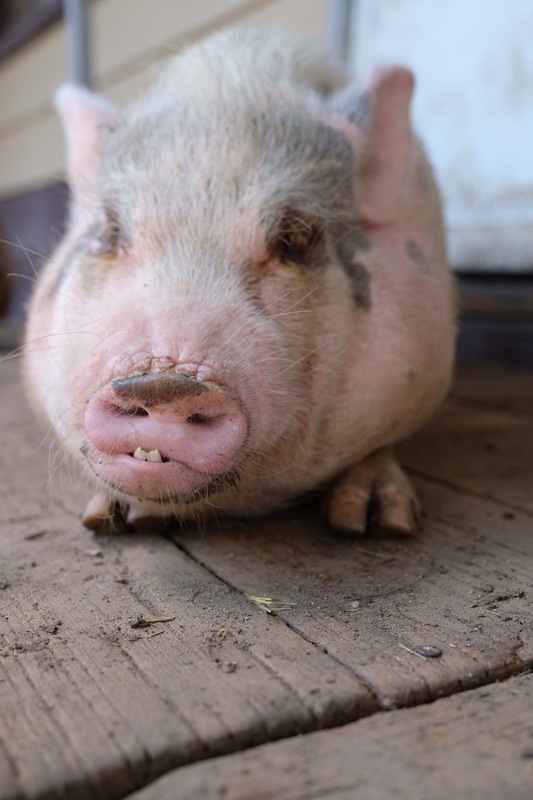 He has made other pig friends, loves the mud, and is living like a king there at Hog Haven Farm. So, although the decision was so hard, I am at least content that he is happy and we made the right decision for him. 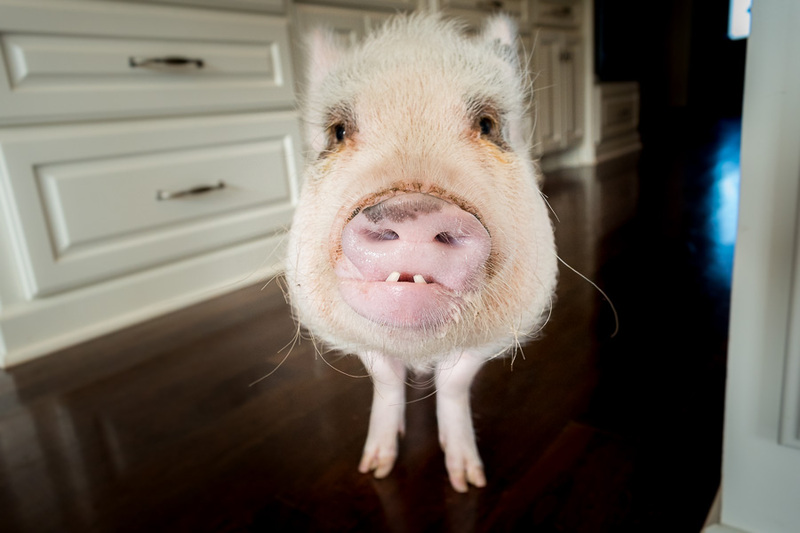 He was also a star on the Denver news when Erin took Oscar and Annabelle to show them off for National Pig Day and, more importantly, to educate people about mini pigs. Here is the link to see Oscar on the news. In fact, I truly think Oscar is happier at Hog Haven than he ever was with us. This was hard for me to accept for a while, despite how happy I was that he loved being at Hog Haven. I felt like we did everything we could for him, including giving him tons of time, attention, and training. However, one thing I’ve struggled with is seeing how happy he is with his pig friends and especially with his girlfriend, Annabelle. Pigs don’t always get along and that’s one of the reasons we never got a second pig as a friend for him, but he has really thrived around the other pigs there. I am incredibly grateful for Hog Haven Farm and for the work Erin and Andrew are doing. As I’ve had a chance to get to know Erin more, she is such a kind, compassionate person. She truly is just one of the “good people” in this world, and I am forever grateful to her for being able to give Oscar such a good home. He is happy, and that’s all we wanted for him. 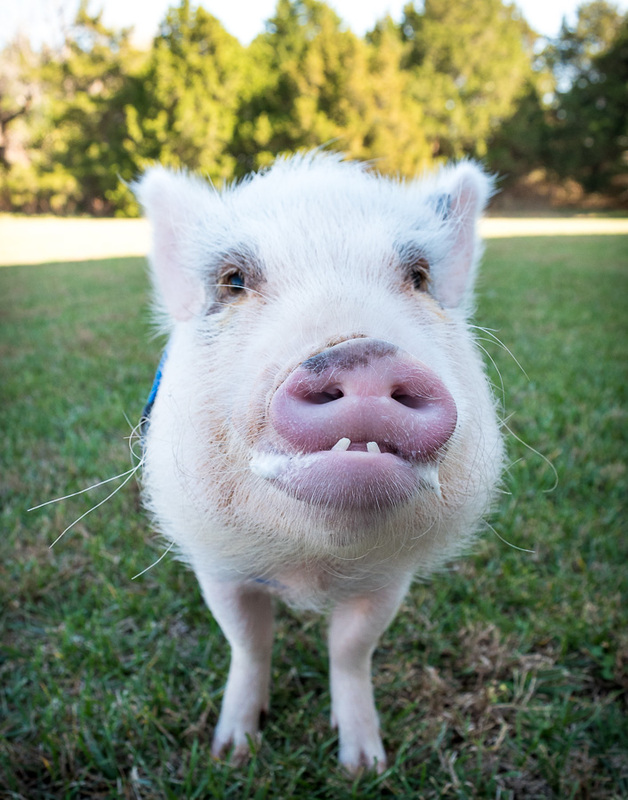 If you are looking for more updates on Oscar, I encourage you to look up/like/friend Hog Haven Farm on Facebook and Instagram. Erin shares pictures of Oscar every once in a while and, if you followed his blog, I know you will enjoy seeing pictures of him happy in his new home. 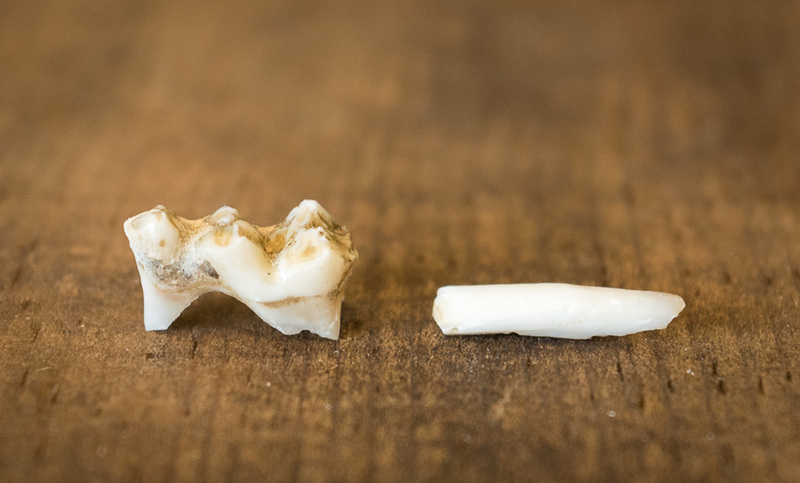 Also, his teeth are still ridiculously adorable. I’ve also learned a lot from Erin throughout this process. We are not alone in our struggle with pigs and dogs. People talk a lot about how pigs are often rehomed or given up due to size, but dogs are the second biggest reason for surrender. Some pigs and dogs do fine together and some don’t. However, as two different species, they really don’t coexist well. Although Oscar was bigger than Rylee and was causing a risk to her safety, it is more commonly pigs who are harmed by dogs. Pigs are prey animals and dogs are predators, and that can result in tragic situations if not carefully watched. 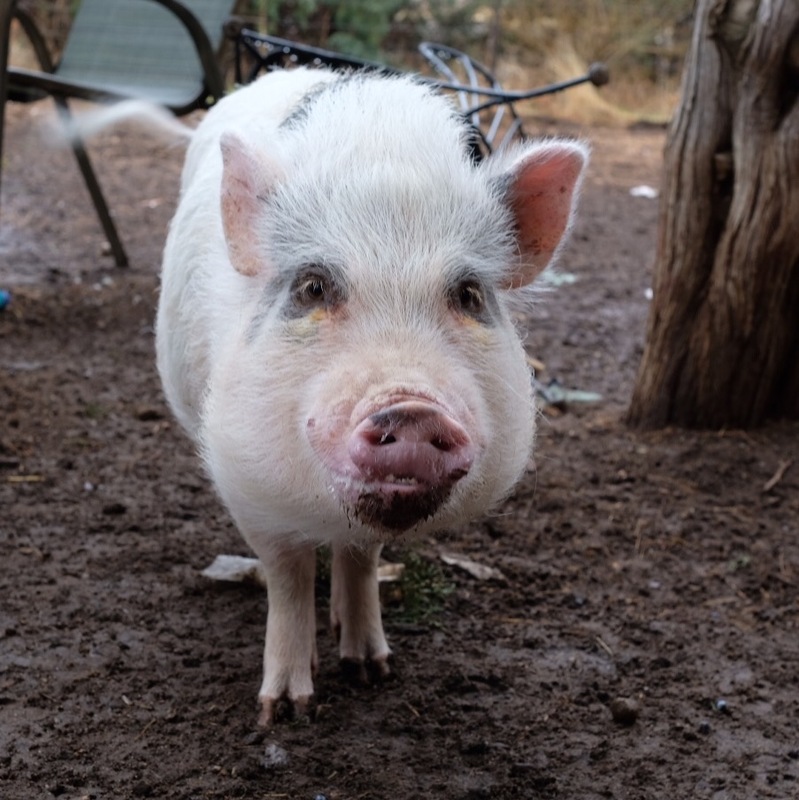 Erin currently has three pigs at Hog Haven who are missing ears from dog attacks, and unfortunately situations between dogs and pigs can end up even worse. When things go wrong, pigs just aren’t able to defend themselves. In our case, things were fine between Oscar and Rylee until they weren’t. I was that animal lover who said I would never give up a pet, but in this case it was one pet I loved and made a commitment to versus another. I’ve considered making this a space to share more about what I’ve learned and provide occasional updates on Oscar, but I haven’t decided for sure yet. I have had a lot of time to think about what I wish I would have known and what information about mini pig ownership still needs to be shared so that people can make informed decisions about mini pigs. What I do know is that I still believe pigs are amazing creatures. I still love Oscar dearly and still miss him every single day. We have a lot of “Remember when Oscar used to…” moments in our home, and there isn’t a day that goes by that I don’t think about him. We had our struggles and frustrations, but I had no idea the lasting impact he would have in our lives that day we brought him home. Oscar exploring and enjoying rooting around in the mud at Hog Haven. Oscar getting extra special rooting and exploring time at Hog Haven for his 2nd birthday. When Oscar was little, I picked him up all the time. I carried him around the house, lifted him up onto the sofa, and carried him up and over our stairs to take him outside several times a day. If I needed to put him in the car to take him somewhere, it was quick and easy. I just picked him up and put him in his bucket seat. When Oscar hit about 30 pounds, I started having trouble lifting him. By that point he had figured out how to jump up on the sofa and didn’t really want to be carried around the house anyway, so those things weren’t an issue. However, getting him outside to potty turned into a chore. We have stairs at each door going outside, so there is no avoiding steps when we take him out. 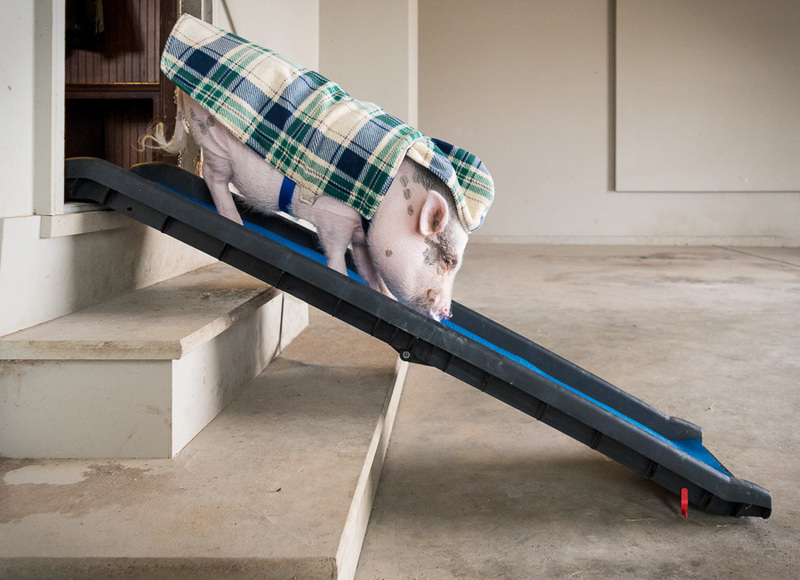 Although pigs can walk down stairs, I try not to let Oscar go up or down stairs when possible since I worry about him hurting one of his little legs. So, this meant lifting him over the stairs each time he went out and, even with just a few stairs, it was becoming a challenge. I decided it was time to try to find a ramp for Oscar to go down. I was skeptical that I would find one to fit securely over the stairs going into our garage and leading up to our porch, but I was also pretty desperate. I looked at reviews and did some measuring, and I finally decided to try one. I picked the Solvit UltraLite Bi-fold Pet Ramp , and I love it. It is a perfect fit for our stairs, folds up easily, doesn’t slide around, is lightweight for a ramp, and Oscar learned to use it in under ten minutes. The only problem I had with the ramp at first is that the texture of the area where Oscar walks up and down is really rough. The very first time Oscar walked down the ramp, I could tell it was hurting his hooves. I grabbed an old yoga mat, cut it to fit inside the ramp, and it works perfectly now. If you are looking for a ramp and decide this one is a good fit for your stairs, make sure to grab an inexpensive, slightly grippy yoga mat (or use an old one) or even using a strip of extra carpet might work. You’ll need it for this ramp to work for pig hooves, but it took me only a few minutes to cut the yoga mat to fit and I’m super happy with the result. Oscar ready to go down his ramp. I was nervous at first about trying to get Oscar to use the ramp. When I first set up the ramp, he didn’t want to go down it. I grabbed a handful of Cheerios and spaced them out down the ramp, and he went right down. I did the same thing for him going back up, and he was trotting up and down the ramp after a few times of doing that. We’ve been using the ramp for almost seven months now, and he and I both love it. 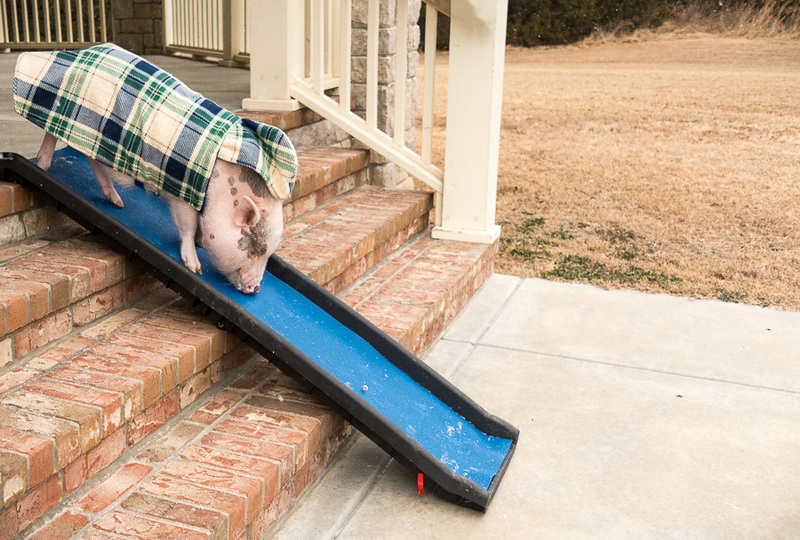 Placing some treats down the ramp is really helpful for training your pig to use it. We used Cheerios, and Oscar learned to use the ramp in about 10 minutes. The other great use for this ramp is for getting Oscar into the car. Last time I took Oscar to the vet, I put his bucket seat in the car and figured I would just lift him up into it. It had been a while since I had picked him up, but surely I could lift him once in and out of the car. I picked him up and only got him up to the floor board before I had to put him down. So, rushing around trying to figure out what to do, I realized the ramp could reach the cargo area of my vehicle. I put Oscar’s crate in the back area of my car, put the ramp up, and he walked right up the ramp and got into his crate. Since the ramp folds up, I threw it and the yoga mat in the back of my car and then just put the ramp down for him to climb out once we got to the vet’s office. It was quick, easy, and safe for Oscar getting in and out of the car. Phew! 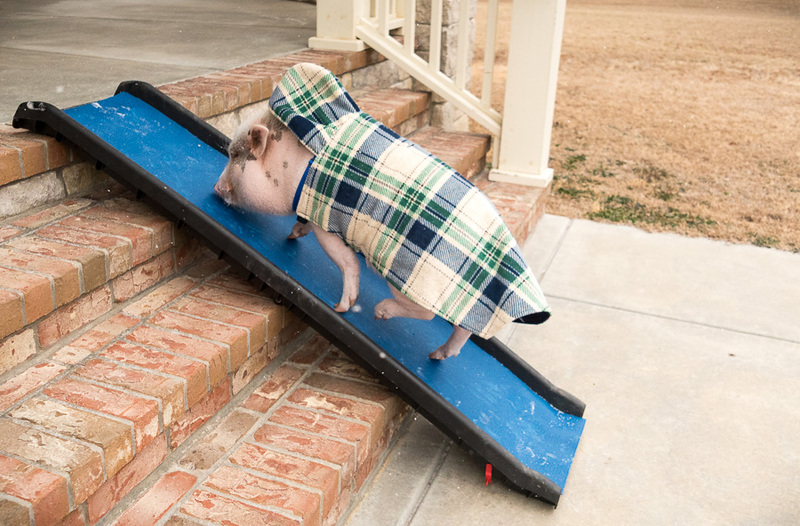 If you’re thinking about getting a ramp for your pig, the best thing to do is to measure the area where the ramp will go to make sure it’s a good fit. This ramp fits perfectly over our garage and porch stairs and into the back of my vehicle, but I don’t think it would be a good ramp for a bed or something that high up in the air. For something that high, this ramp would likely be too steep and probably wouldn’t be your best bet. 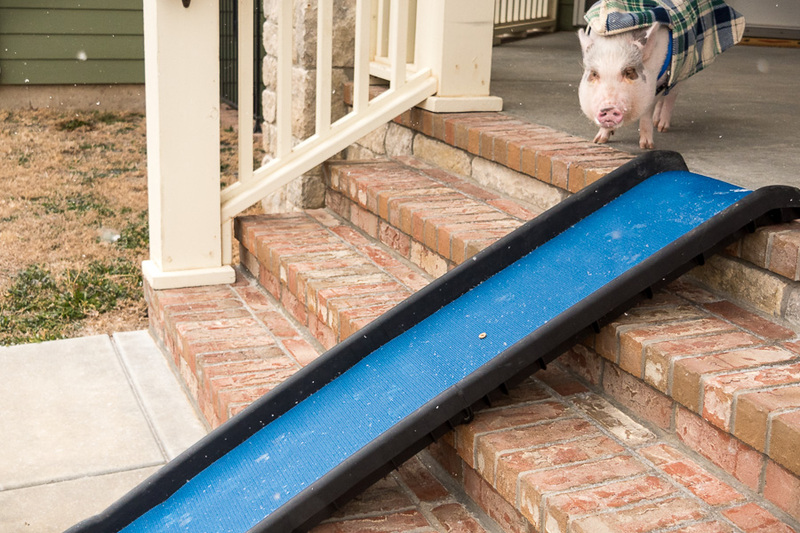 But, I absolutely love this ramp, and it makes taking Oscar in and out of the house so much more pleasant. 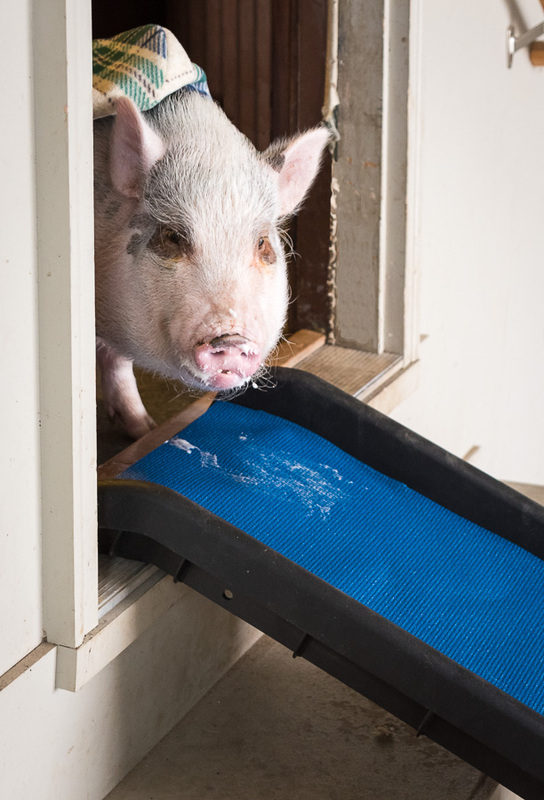 If you have a growing pig and are looking for a ramp, definitely check out the Solvit UltraLite Bi-fold Pet Ramp because it has worked really well for us. 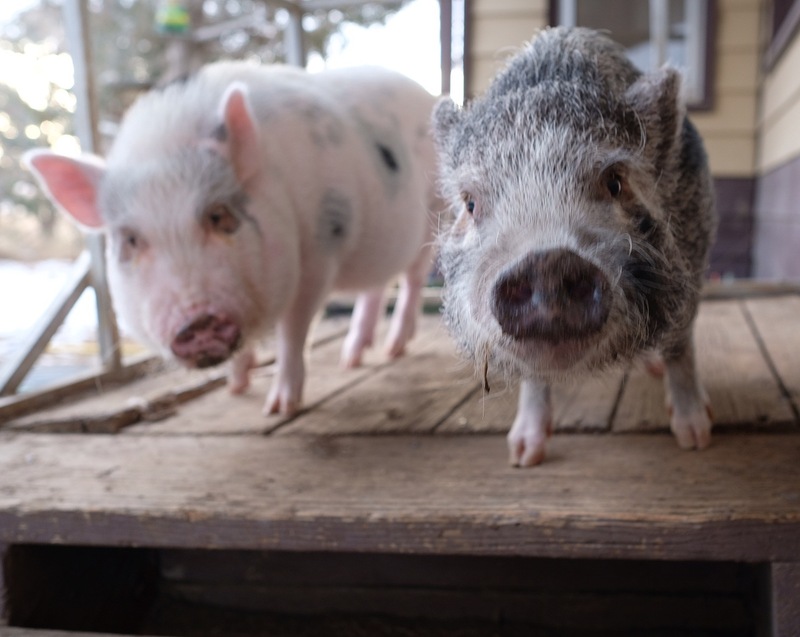 We recently had the opportunity to be interviewed for an article in Rodale’s Organic Life titled 8 Things You Need to Know Before You Adopt a Mini Pig. The interview gave us an opportunity to talk about life with Oscar, both the positives and the challenges. 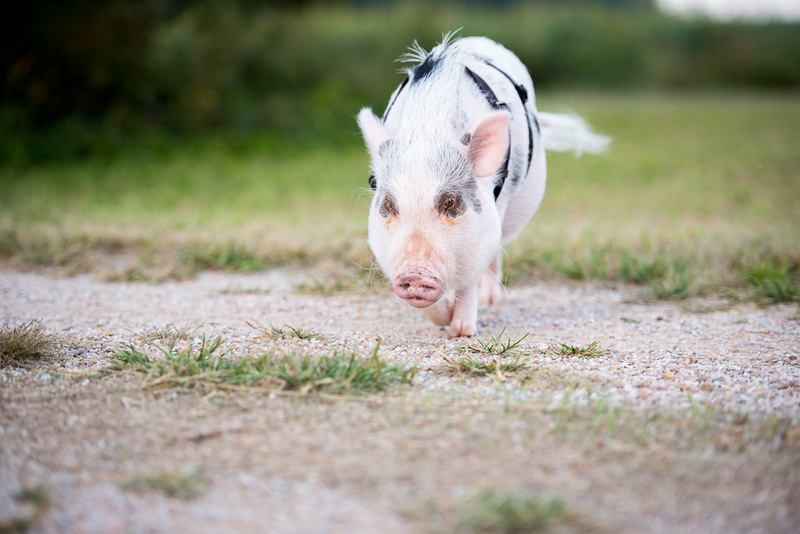 I’ve discussed on the blog how important it is to research before bringing home a mini pig, and the article written by Marygrace Taylor does a great job of highlighting eight important things to know about mini pigs and is an awesome place to start your research. 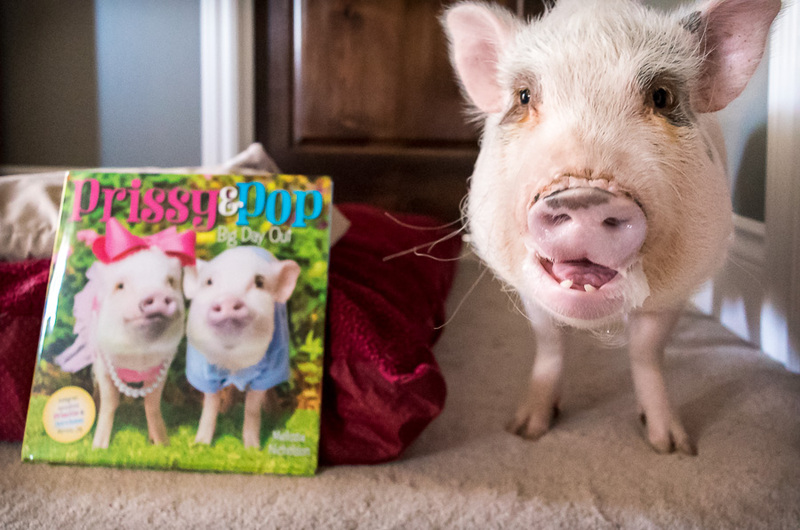 One thing I love about the article is that it also discusses mini pig ownership from a pig rescue’s perspective. Richard Hoyle from The Pig Preserve was also interviewed, and I think it’s important for pig lovers to know what’s happening in rescues. The more I become involved in the pig community, the harder it is to ignore the real issues our community is facing. 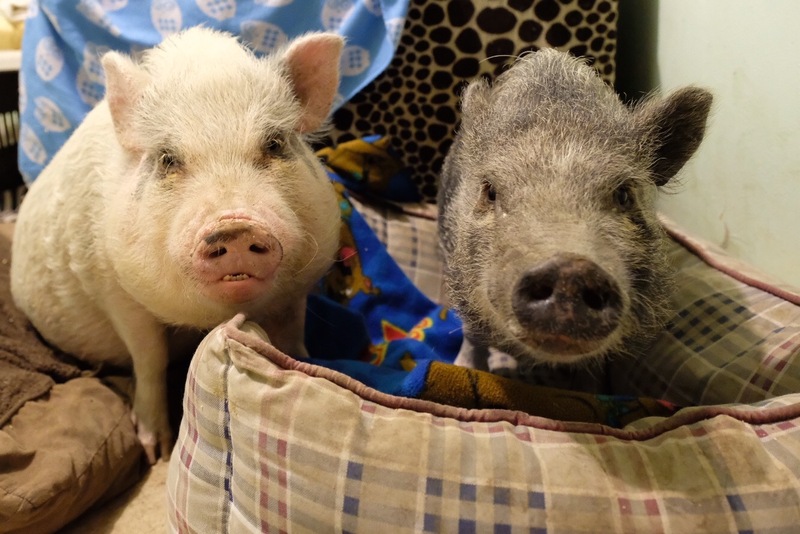 Mini pigs are wonderful but challenging pets, and there are more and more ending up in shelters due to owners who either didn’t do their research, had life circumstances change, or who just could no longer care for their mini pig. Unfortunately, this is putting a huge burden on sanctuaries and rescue groups that are already over capacity and trying to keep up with the resources necessary to care for these pigs. 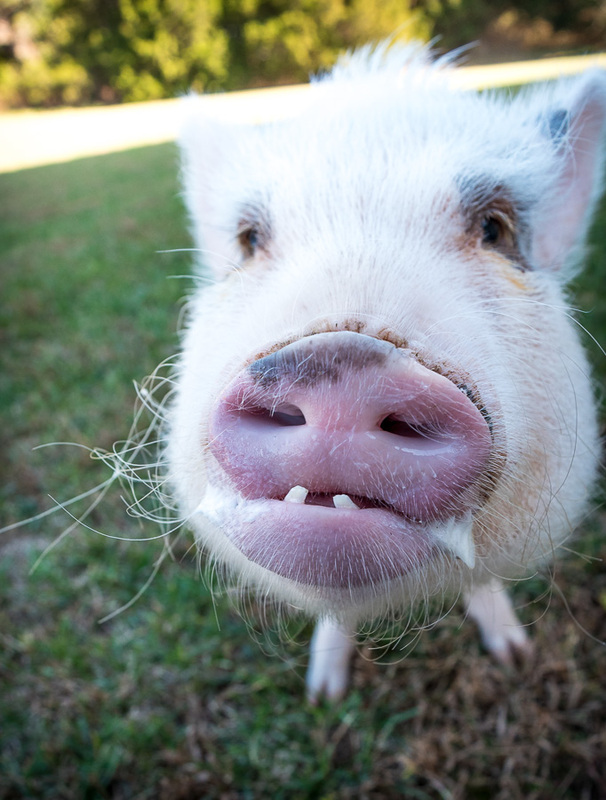 There will of course be times when situations outside of a person’s control require rehoming a pig, and rescues and sanctuaries are great for helping in those times. 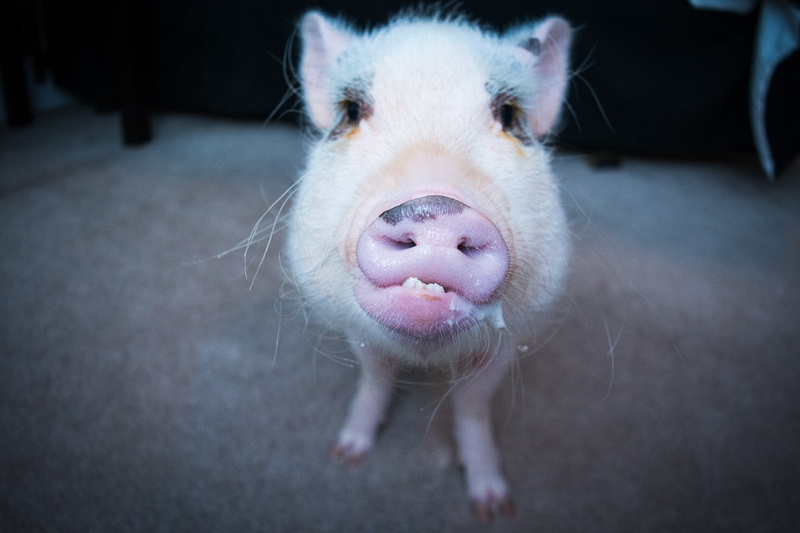 But, with mini pigs as pets becoming more popular, I think the real problem is lack of research before pig ownership. 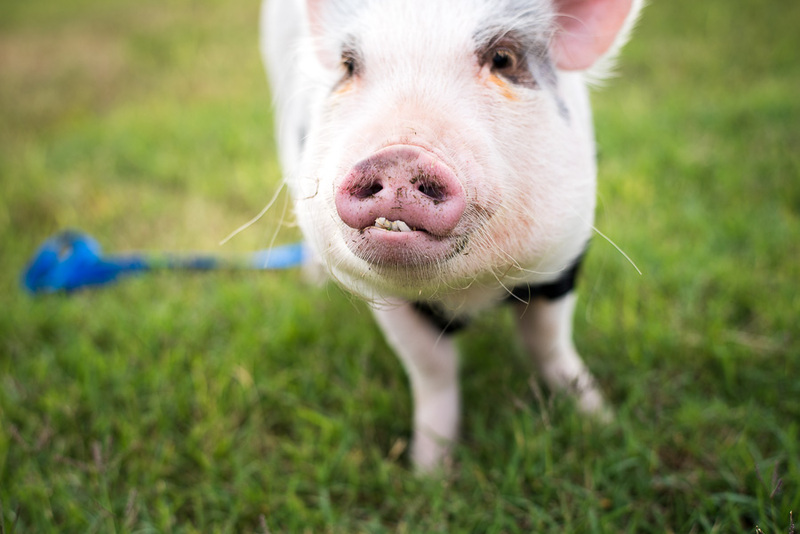 Fortunately, there is a lot of information online about both the pros and cons of living with a mini pig, and articles like the one in Rodale’s Organic Life make it easier for people to access and share this information. 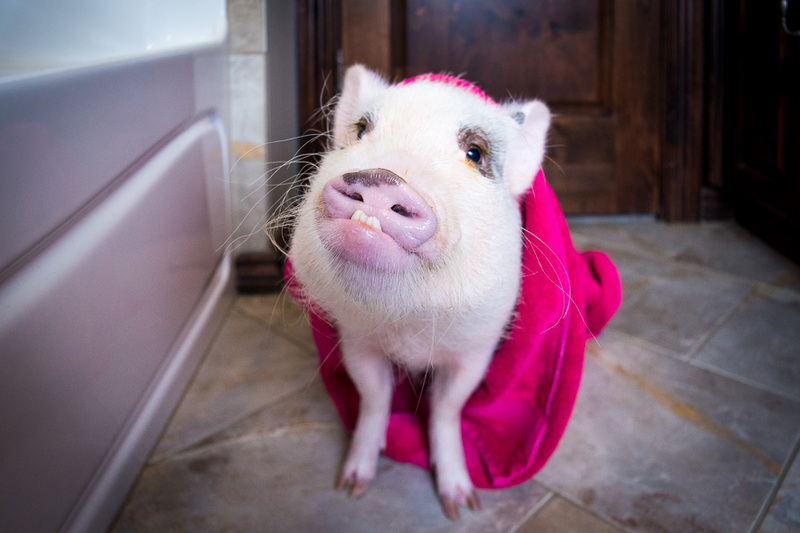 Oscar certainly doesn’t represent every mini pig because they all have different personalities and preferences, but the article provides a general idea of what to expect when bringing a mini pig home. An extra bonus is that there are several adorable pictures of Oscar in the article! 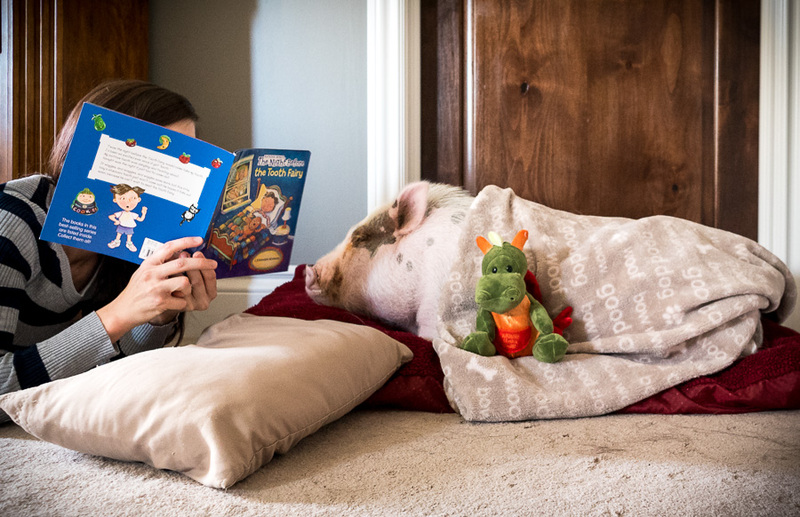 For prospective pig parents wanting to know more about life with a mini pig, below is a list of some of our blog posts that will help as you continue your research. 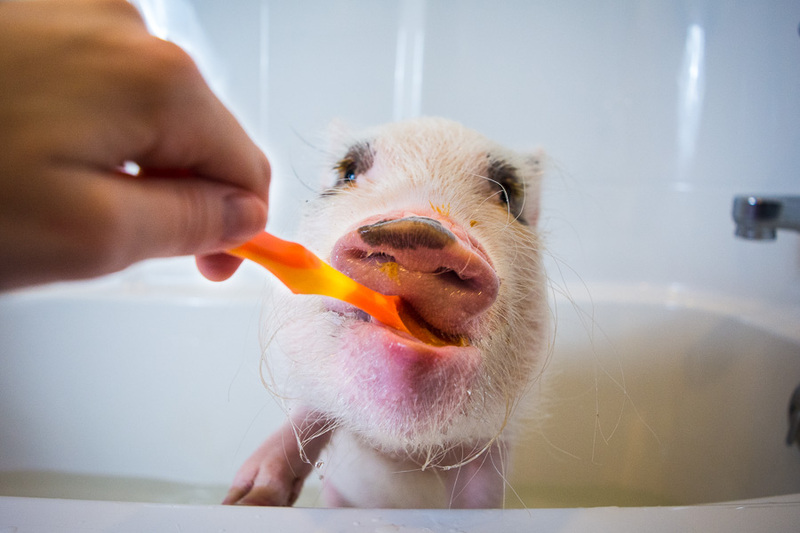 These posts touch on the lesser-known aspects of mini pigs as pets and will help you get a better idea of what to expect when you bring your new mini pig home. A huge thank you to Marygrace Taylor and Rodale’s Organic Life for giving us the opportunity to talk about life with Oscar! Last summer, my Facebook and Instagram feeds were full of pigs cooling off in small plastic pools. 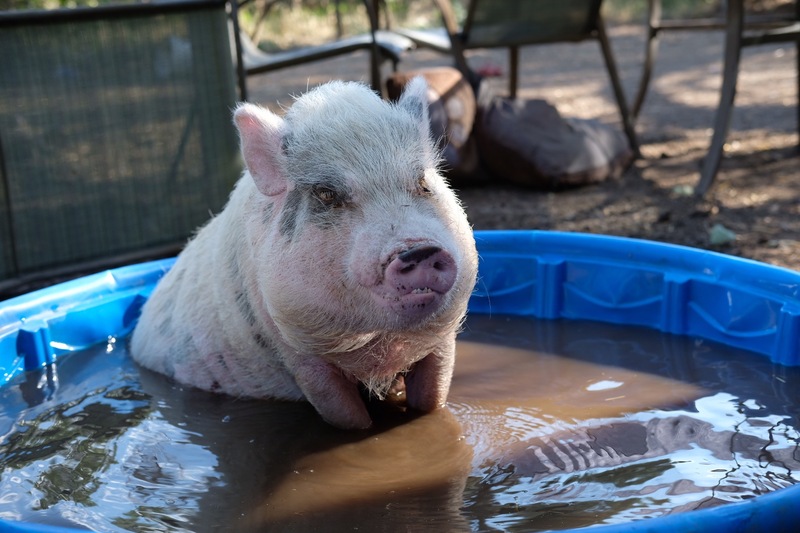 Their pig parents put a little water in a kiddie pool, and the pig climbed in and happily sat or splashed around, cooling off from the summer sun. I was so excited to let Oscar play in his own little pool! I waited until he was about 5 months old and then found him a pool to fill up for his first pool party. It was going to be his first time in water, and he was going to love it! I put him in the pool, but then he jumped right out. I put him back in; he jumped out again. He finally jumped out the last time and ran off. He hated water. I gave up on the pool, but then I started wondering how in the world we were going to bathe him if he hated water. Since Oscar had several skin issues when he was younger, including mange and a skin infection, we intentionally held off on bathing him for a long time. We didn’t want to stress him out or dry his skin out more than necessary, so we just wiped him down every few days with a damp towel instead. However, even that was a challenge because he didn’t like even the small amount of water on the towel touching him. Wiping Oscar down kept him pretty clean until we were ready to try giving him a bath. Oscar was about 10 months old before we finally tried because we knew it would be a struggle. We also waited until the weather warmed up a bit because we didn’t want to risk getting water in Oscar’s ears and increase his chances of pneumonia during the cold winter. 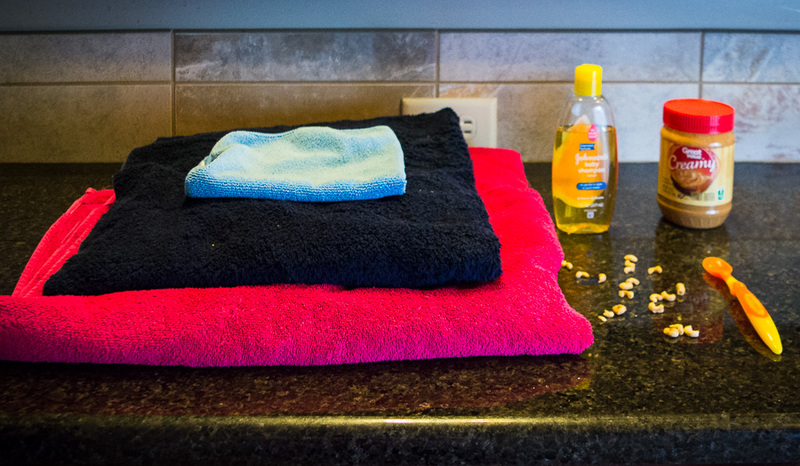 Before giving Oscar a bath, I get everything ready. I get him towels, a washcloth, baby shampoo, peanut butter, Cheerios, and a baby spoon. A large plastic cup also helps with rinsing the shampoo. My husband and I teamed up for Oscar’s first bath. I got the shampoo and towel ready and added a small amount of warm water to the bath tub. My husband grabbed the peanut butter, a spoon, and Oscar. Our plan was to put Oscar in the warm water and then I was going to wash him quickly while my husband fed him peanut butter from a spoon. A lot of people prefer to put peanut butter on the side of the tub, but we just used a spoon since there were two of us and we wanted to avoid any chemicals that might be on the side of the tub. We put Oscar down in the tub, and he freaked out! He panicked and kept trying to jump out of the tub, which meant his poor little hooves didn’t have any traction and kept slipping. On top of it, he was squealing and splashing water all over us. We didn’t want him to slip and fall, so we picked him up, put him in the towel, and dried him off. We needed to rethink our strategy. Our biggest mistake for Oscar’s first bath was not having a bath mat since he didn’t have a way for his hooves to grip in the tub. It probably would have been fine if he stood still, but his panicking and wiggling made him slip, which made him panic even more. We decided to get a bath mat and then try again but without water. 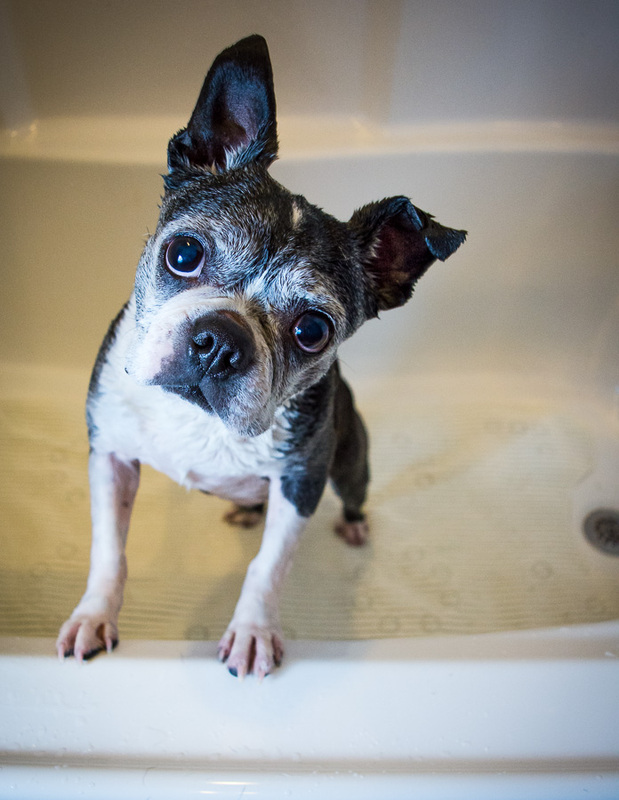 We wanted to just get him used to being in the tub and make it a happy place by using peanut butter before we even added water. I bought Oscar’s bath mat from Target so this isn’t the exact one I use, but it’s really similar. I bought a bath mat, put it in the tub, and we tried again. We set Oscar down on the bath mat and immediately started giving him peanut butter from the spoon. So far, so good! I let Oscar get used to the tub and enjoy the peanut butter for a few minutes and then I started slowly running warm water in the tub. I figured he would panic as soon as the water touched his hooves, but he didn’t. He was so focused on the peanut butter that he didn’t even notice. I ran just a small amount of water, enough to clean off his hooves and splash some on his belly, since I didn’t want to scare him. I quickly bathed him and rinsed him off, and he didn’t mind at all as long as the peanut butter kept flowing. As soon as the peanut butter stopped though, he remembered he was in water and all bets were off. We finished up, dried him off thoroughly, and considered it a success! Oscar with his peanut butter spoon. Peanut butter on a spoon is how we keep Oscar calm during his baths. Oscar has had two other baths so far, both of which were successful. Each time I run just a little more water and bathe a little more of him, being careful not to get water in his ears, and he handles it fine as long as he has constant peanut butter. He eats more peanut butter during his baths than I would normally give him in a day, but we only bathe him when it’s absolutely necessary, so I don’t worry about it. My husband has helped me bathe Oscar each time, which has made the process easier. 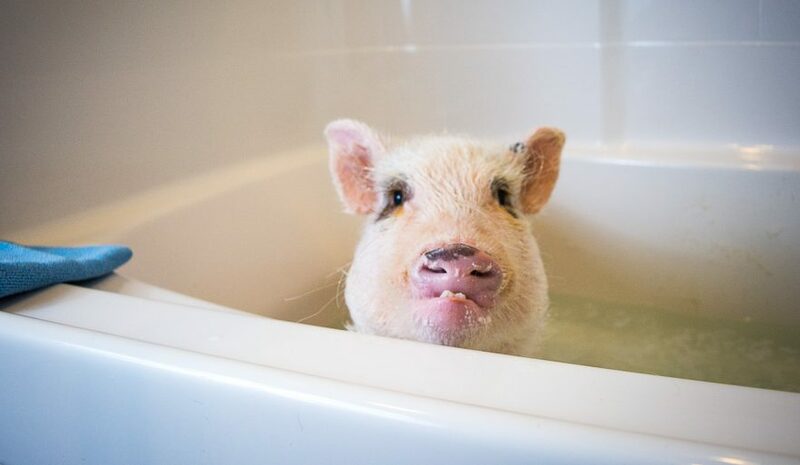 However, I have received some really helpful tips over the past few months to make bathing a mini pig easier, particularly with just one person. 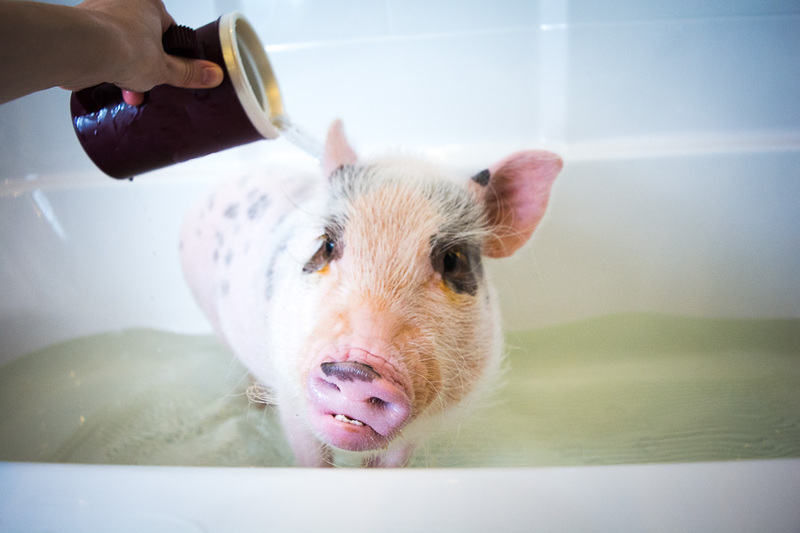 A really popular one is to smear peanut butter on the side of the bath tub to keep your pig busy during her bath. I avoid that one if possible just because I’m worried about Oscar licking up chemicals from the side of the bathtub, but I am open to trying it someday when I need to bathe Oscar by myself. Another great idea someone shared with me is to cut up apples or use some other small treat like blueberries or Cheerios and put them in the bathtub. 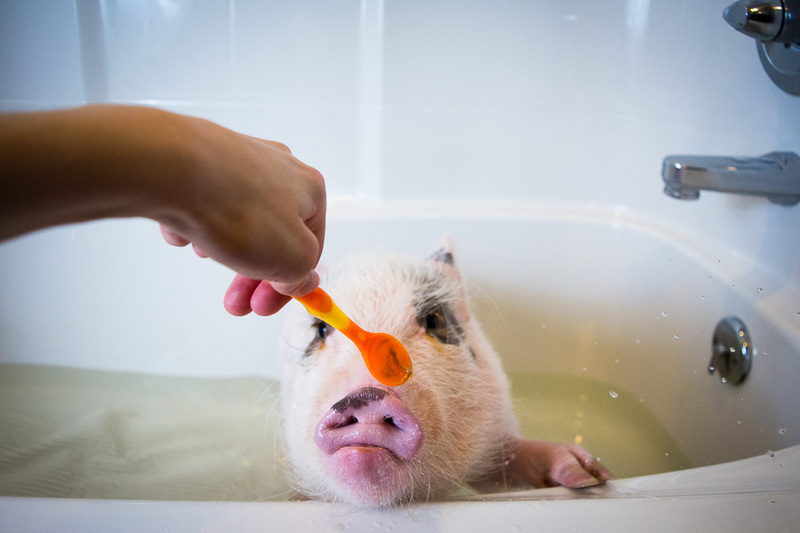 Many pigs will keep themselves busy searching or bobbing for the treats and won’t mind the bath as much. We started with peanut butter since it’s a really high-value treat for Oscar, but hopefully we can switch to something smaller and healthier once he’s more used to the process. Using a washcloth during his bath helps get any rusty spots off of Oscar. A large cup is handy for rinsing the shampoo off. Once Oscar’s bath is finished, I towel dry him as much as possible. He doesn’t like the towel much, so then I dry him off the rest of the way with a hair dryer. I keep the heat low and usually put his harness on before blow drying him so that I have a handle in case he tries to run off. He doesn’t care for the hair dryer, but I like to make sure he’s dry to reduce his risk of pneumonia. As soon as his bath is finished, I towel dry Oscar as much as possible. After towel drying, I dry him the rest of the way with a hair dryer. Putting his harness on gives me a handle to keep him close while I finish drying him. Don’t worry – Rylee was next but she got Cheerios too. After Oscar finished his bath, Rylee was next. 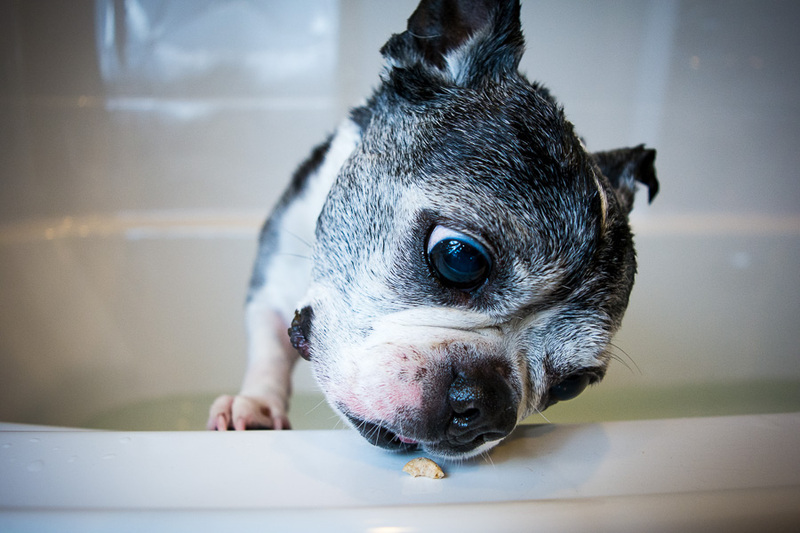 Rylee is used to baths and behaves well, but she got some Cheerios anyway. 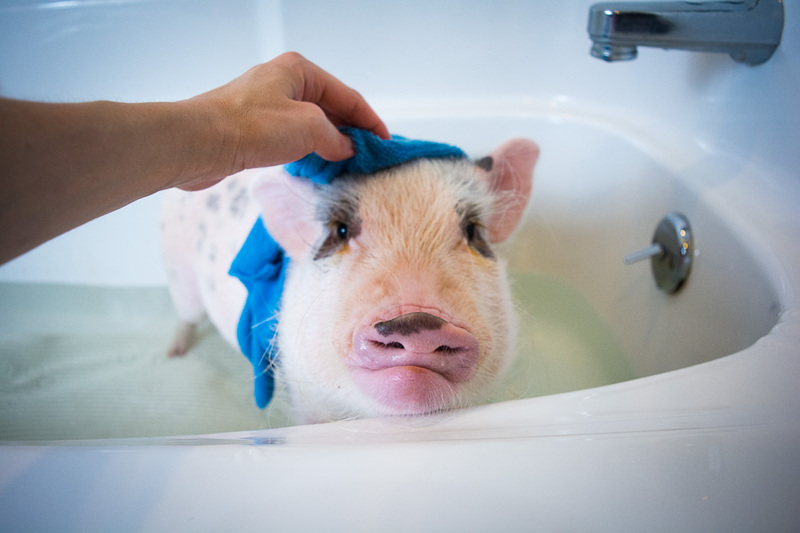 There are so many pigs who love water and don’t mind baths. 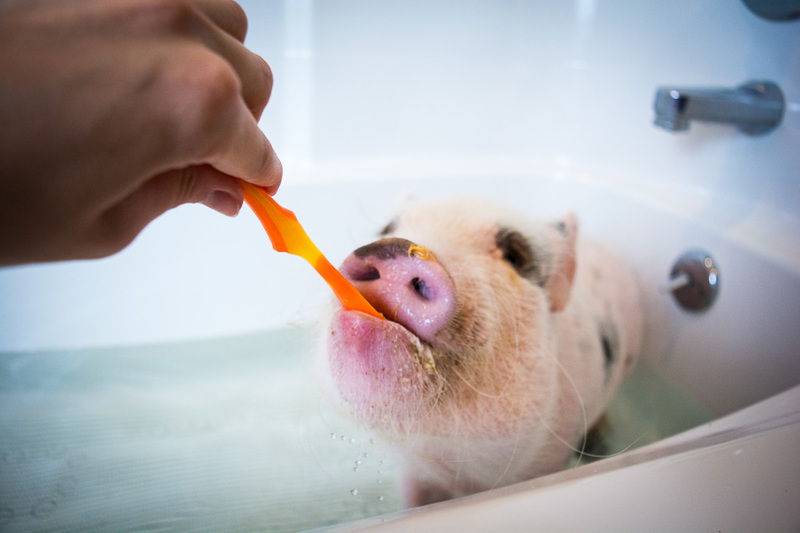 However, if you’re like us and have a pig who hates water, hopefully our experience will help as you try to bathe your mini pig! Note: The link above is an affiliate link. LifeWithaMiniPig.com is a participant in the Amazon Services LLC Associates Program, an affiliate advertising program designed to provide a means for sites to earn advertising fees by advertising and linking to amazon.com.